Non-toxic and biodegradable, this 4-piece kids snack bowl set is crafted of natural bamboo – much safer than plastic. Plus, it’s stylish, lightweight & dishwasher safe. Perfect for the whole family. Cartoon characters and animal prints are only cute for so long, but our versatile snack set carries your child through every adorable stage with classic, neutral colors the whole family can enjoy. Unlike ceramic dishes that are heavy and easily breakable, your bamboo dish set is durable & lightweight. Stash it in your diaper bag or car and always have a toxin-free way to serve your toddler’s favorites. Ideal for picnics, restaurants, traveling and more. When ready to wash, just toss it in the top rack of your dishwasher for quick & easy cleaning. You can try your toddler bowls for a full 30 days, and if you aren’t completely satisfied, simply return them for a full refund. Add to cart now. Would make a wonderful gift for preschoolers & birthdays, so order a set for yourself and a loved one today. TAKE BACK YOUR INDEPENDENCE! : Hi Mama! Yeah, you. We see you over there, caked in dried milk and baby drool . Are you tired of your little one calling all the shots? Feel like you can never have “nice things”? Think you’ll go crazy if you have to hear Moana or Daniel Tiger one more time? With the Bobo & Boo 4 piece Snack Bowl Set , you can take back dinner time! Perfectly sized for little fingers but beautifully designed for adult eyes, these kids bamboo serving bowls can be enjoyed by all! HASSLE-FREE, WORRY FREE: With BPA and Phthalates being in the majority of plates for toddlers, it’s difficult to find serving bowls that are both loved and safe for children. If you are concerned about plastic and chemicals in food products, then this dish set is for you. Our baby snack bowls are made of natural bamboo, making them toxin-free and food-grade . FDA and parent approved, the Bobo & Boo reusable bowls for kids makes mealtime just a little less stressful. ECO-FRIENDLY : Our bamboo dishes for boys and girls are renewable & sustainable, making them environmentally friendly . Whether using them in your home or for the great outdoors like picnics, camping, barbeques, birthdays, backyard parties, or lounging by the pool, you can feel good knowing that you’re helping to keep this planet preserved for your little ones. 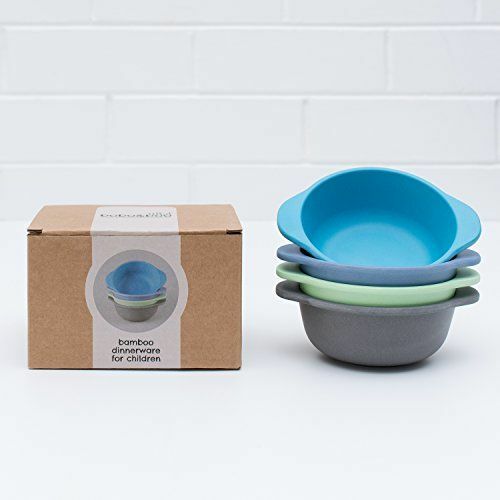 Made by mothers, loved by mothers , and safe for mother earth, these snack, lunch, and dinner bowls are a MUST for every household. KID-FRIENDLY: At Bobo & Boo, we know how frustrating dinnertime can be for parents . Between your one toddler refusing to eat anything green and the other child acting like he’s food-critic, Gordon Ramsey, meals can sometimes feel like an uphill battle. While we can’t guarantee this dinnerware will make your kids less picky, we CAN guarantee that you don’t have to worry about what they’ll do with them. These BPA-free snack bowls are shatterproof , dishwasher-friendly , high-quality and durable. STYLISH AND TIMELESS: In an effort to help parents regain some semblance of independence, we created this bowl set for kids AND adults. Beautifully designed with bright colors, these bowls for eating are fun for infants and toddlers, but have a classic look so grown-ups can enjoy them, too. Say buh-bye to Elmo and Frozen. Our simple dishware can be used and enjoyed at any age. Lightweight & versatile, kids will use them for years. You can also mix & match with our full line of products & colors. Cute but more breakable than I’d like for a kids product I really really wanted to love these. The colors are very pretty. They are a good size for my toddler. I hand wash these because other reviews have said they start showing wear in the dishwasher. Not a big deal. But, we’ve already broken one. The 20 month old dropped it onto the tile and it broke into 3 pieces. If I’d known they would break that easily I would have chosen a different product. We initially LOVED these bowls and were so excited to replace our … We initially LOVED these bowls and were so excited to replace our plastic kid dishes with bamboo. We purchased multiple sets of bowls and plates as Christmas gifts for our kids. It is less than 3 months later and one of the bowls already has two huge cracks rendering it unusable. We almost always wash the bowls by hand except for once or twice in the top rack of the dishwasher. We have over 20 bowls so it was used in a rotation. Disappointing for how much we spent.